Apple has flaunted iOS's software keyboard since the original iPhone, but the now-familiar input device saw scarce upgrades until iOS 8 added a new QuickType predictive suggestion bar. AppleInsider takes a look at how users can make the most of the new —and some old— features. 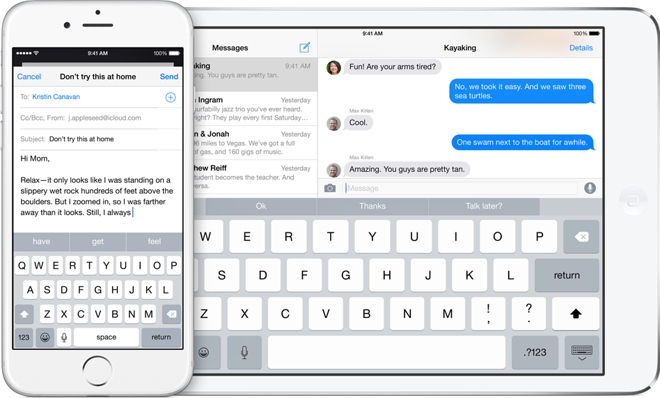 Apple actually introduced two keyboard-related tentpole features in iOS 8: third-party keyboard support and QuickType predictive text. Third-party keyboards function in much the same manner as they do on competing mobile operating systems, replacing the default system keyboard with a new one —many of which are, similarly, also available on other platforms. QuickType, in contrast, is Apple's own take on predictive text entry. The keyboard will analyze the text you've typed so far, and suggest words that it believes you're most likely to type next. QuickType even takes tone into account —more relaxed words and phrases, like "I totally love this," will be used in instant messages while emails will get more formal language, such as "as you requested." Removing the predictive suggestion bar —which sits just above the default keyboard —from view temporarily is quite easy. Simply tap anywhere in the bar and drag downward —it will collapse into a thinner gray line with a white grab handle. An oft-overlook feature of iOS— and OS X— is the ability to define text shortcuts that can be used to insert longer pieces of text. For instance, you might set easily-remembered shortcuts for complex mobile phone carrier text codes that let you check your balance via SMS, or you could configure a quick way to insert your email or mailing address for filling out web forms. The resulting dialog asks for two items— a phrase and a shortcut. The phrase is the longer piece of text that will be inserted, while the shortcut is what you'll actually type. In our case, we've added the shortcut "@@@" for "[email protected]"
To test your new shortcut, head to the nearest app with a text entry field. You can see that when we type @@@, iOS automatically shows it as a QuickType suggestion and a space will expand it to [email protected] —a big time saver.